This Middle East-inspired dish uses plenty of garlic, saffron, fresh thyme, and pine nuts to flavor chicken thighs and Jerusalem artichokes, also known as sunchokes. Sunchokes are not artichokes. They are an edible tuber that grows underground. They look a little bit like large knobs of ginger and taste slightly nutty like a cross between an artichoke heart and a potato. In this lemon chicken recipe, chicken thighs are quickly browned before being slowly simmered in a simple garlic chicken broth with fresh lemon juice and grated zest. Saffron adds a delicious flavor and beautiful color to the dish. Chicken thighs make for an especially tender and inexpensive protein option for family dinners. They also work out to be perfect individual portions of meat. Finely grate 1 teaspoon of zest from the lemon and set aside. Juice both of the lemons (discarding pulp and seeds) and set aside. Place a large, deep, heavy skillet over medium-high heat. When hot, add 1 tablespoon of the olive oil and swirl to coat the bottom of the pan. Sprinkle chicken thighs on both sides with salt and pepper. Place skin-side down in the hot pan to quickly brown them, turning only once. Remove to a plate and keep warm. Add the lemon juice, lemon zest, remaining tablespoon of olive oil, chicken broth, and saffron to the skillet. Bring to a boil, stirring to loosen any browned bits. Add Jerusalem artichokes, and garlic cloves. 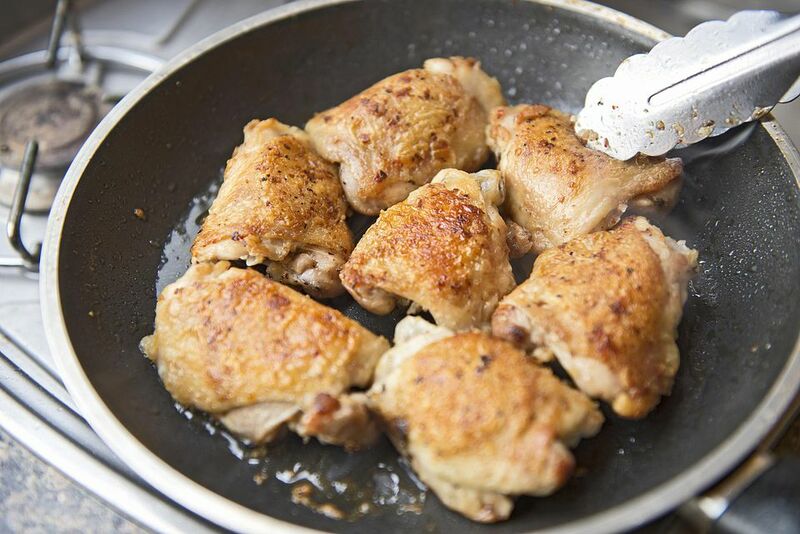 Return chicken to the skillet, along with any accumulated juices. Reduce heat and simmer for about 45 minutes, until chicken and sunchokes are tender. Stir in cream and thyme leaves. Taste and adjust seasoning, if needed. Return to a simmer and cook an additional 10 minutes before serving. Serve this lemon chick with Jerusalem artichokes over cooked rice and sprinkle with pine nuts to garnish. Though delicious, the cream may be omitted from recipe to suit dietary needs or restrictions. Many grocery stores and markets now sell toasted pine nuts, but they tend to be more expensive than their raw counterparts. If you wish to toast your pine nuts, you can roast them in a single layer on a baking sheet at 350 degrees Fahrenheit for about 10 minutes, shaking or stirring halfway through. You can also toast pine nuts on the stove in a skillet stirring until fragrant and golden brown — but beware, they can burn quick. You can use any hot cooked rice you wish for this dish including brown rice options, but we suggest opting for an aromatic basmati or jasmine long-grain rice.